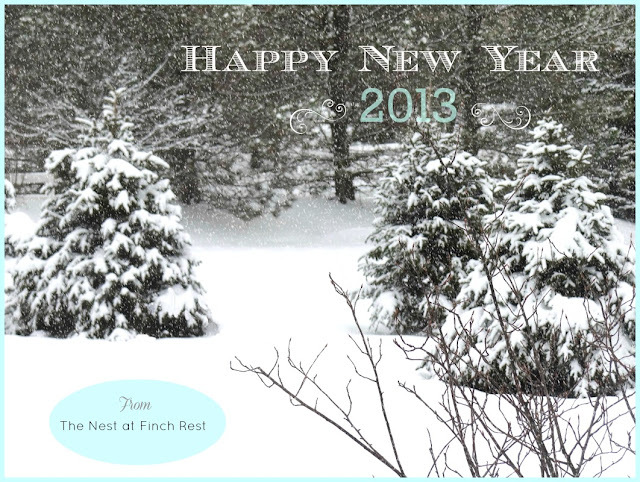 The Nest at Finch Rest: Happy New Year 2013! Today marks my one year exactly bloggaversary! my most sincere wishes for a happy, healthy new year! And I sure am looking forward to another fun year to come! Oh, and my "word" for this year for my self is "organized." I wish to be much more organized in the next 12 months. Till then, enjoy your holiday and start of new things. Remember to be good to yourselves. Happy Anniversary! I have sure enjoyed your blog. Happy Anniversary Michelle, you're such a bubbly person and it shows in your posts. I guess my word could be 'organized' too for as I took down the decorations this morning, everything was boxed according to where it goes and labelled. This is a first for me after 40 married Christmases. I'm also organizing my life a little better, some things that were put into place last year will take effect this year. I do the organizing thing EVERY YEAR. I love to organize, plan, and make lists. My big challenge for this year is to lose some weight and get in shape! Come on over and join me in an online "workshop" to "Live Your Dream Life NOW!". We begin on January 7th. Happy New Year! Happy Birthday to The Nest at Finch Rest. Blogging is addictive! :D :D So many nice, talented, generous folks to meet. No special word or resolutions for me -- except to write 2013 instead of 2012! I just want to keep plugging along! Happy New Year and blogiversary Michelle! May this year be even better! Happy Anniversary and 2013 Michelle. looking forward to another year of lovely posts from you. I was going to start small with organizing something today. Didn't happen, but the day's not over yet. A beautiful New Year to you with organizing to your heart's content. Happy Bloggiversary! I am so happy that I found your blog a few months ago...you are so sweet and inspiring! I love the new word you chose, I wish organizing just came naturally to me! lol! I have chosen joy. How can you go wrong with that in your life? ChEeRs to YOU!! !♥ Happy New Year! Happy Blogiversary, Michele! And, Happy New Year, too!